In sitting down to write this post I was struck with the width of the topic. Not Seth Godin, but cosmetic medicine (laser clinics, med spas, skin clinics) and how successful medical practices are built and run. It's no easy task. Which brings up Seth Godin. Seth has a job. He describes it as being Seth Godin, noticing things that don't have an existing vocabulary and giving words to people so that they can talk about concepts that didn't have words before. 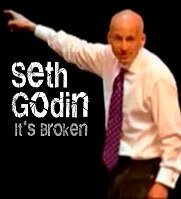 Seth's quite good at this as, since there's a scarcity of Seth Godin's in the world and he's the only one. Scarcity. Superstars. Best in the world. Remarkability. Mantra. All things I've blogged about but not really focused on in a coherent pattern. In effect, I've missed the forest for the trees. I'm going to try to talk about a few of those trees. They're the ones you're using to build your business. There are now many smart docs reading this site. Some comment, most do not. It's a statistical fact that only about 1% of any interaction you have (including blogging) elicits a response from the people you're interacting with. I'll guess that many come and scan the list of recent comments along the left side of the page rather than read what I'm writing about. That's good, fine, and by design. Decentralized but organized systems win every time. Seth is used to talking about markets and retail. This site is for physicians in retail medicine (It say's so right at the top.) so I'm going to use some of Seth's words and some of my own. I think they're good ones. Doctors in retail medicine have been operating at a disadvantage. Due to certain idiosyncrasies of the medical marketplace they've not had access to the resources that other retailers take for granted. The medical spa franchises are a first studdering step to bring systems to the marketplace. My own feelings are that the current crop are doomed to fail because they don't fulfill what is needed to succeed. Scarcity? Remarkability? Best in the world? No. If you've sat through any of the medspa franchise discovery days what you hear is this: Turn key operations. Low hanging fruit. Uniformity. Those are not the words that build successful businesses. These are the words that build commiditzed, mediocre, average, and struggling businesses. The good news? There's also a scarcity of superstars. There's room at the top. Medicore's where the crowd is.